“These are our rock stars” shouts Isabel, the local guide, her voice almost lost in the wind while we swoosh over a snowy downhill run, framed by craggy rocky summits that look like giant dragon teeth about to gobble up us tiny (fly sized) humans. Sharing the same first name gives us an early camaraderie. 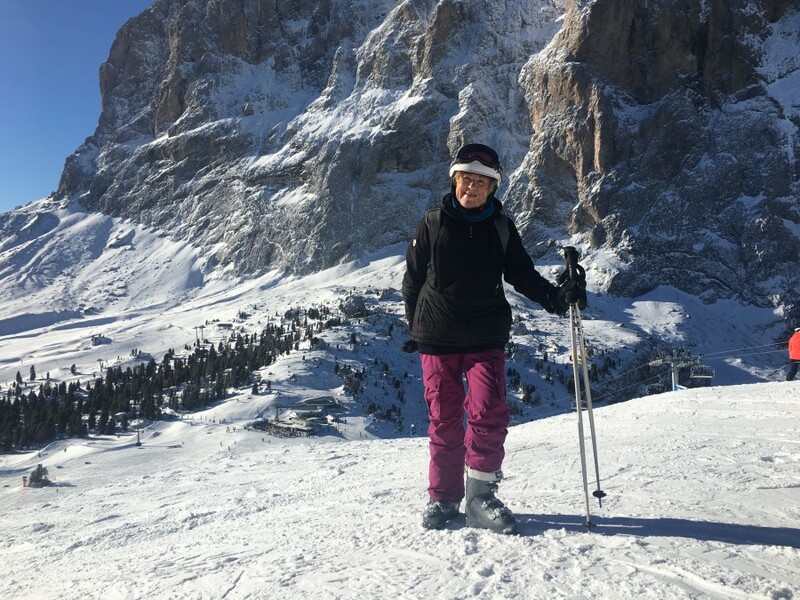 Watching this nervous occasional skier, the ‘other’ Isabel, no doubt born on skies, points to the most famous race slope of Val Gardena, if not the entire region, a challenging black world cup downhill run “Saslong” deep in the Dolomites, asking if I want to give it a go. I’ve got news for Isabel. Observing my skiing bad habits, like a tendency to lean back instead of forward, patiently doing her best to correct them, she is surprised that I have already made the acquaintance of this allegedly notorious slope. The previous morning, to my subsequent delight – not knowing in advance that we are on the legendary” “Saslong” I’ve skied it and enjoyed the experience, albeit in tortoise mode. Confidence building earlier runs – it’s my first day’s skiing of the season – good conditions and knees that are still working as they should, take me down without losing my ‘mojo’. It is my first ever glimpse of the Dolomites, a UNESCO World Heritage site, surrounded by snow and bathed in January sunshine. Any first timer cannot but be smitten by their grandeur, shape and how strangely friendly they are compared with the Alps. Maybe that has something to do with the fact that you cannot ski directly off these dragon teeth and craggy walls, resembling the tail of a giant lizard, originally formed as Coral barriers. Some of the Dolomites jagged peaks reach heights of up to 3,000 m and even in the depths of winter the gorgeous twilight pink hue for which they are famous shines through and their walls glow. 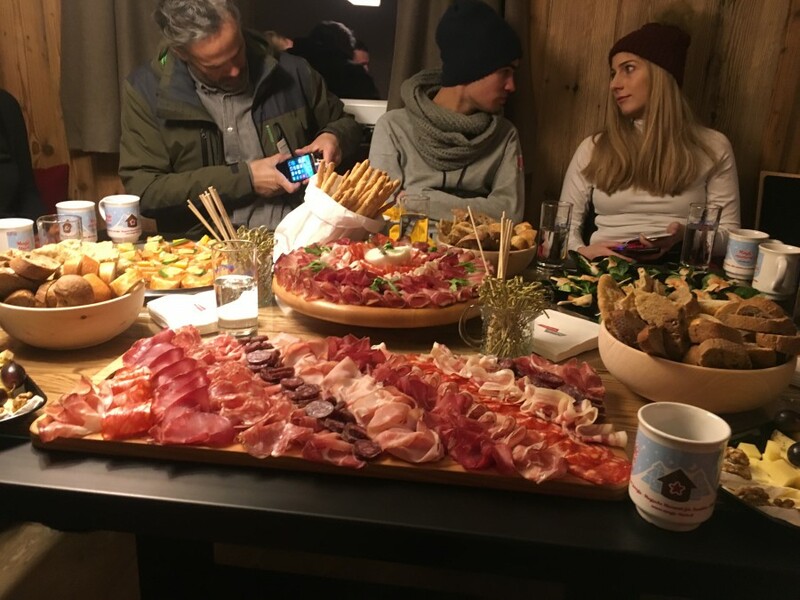 Our mission is to explore as much as we can of the Ortisei, Santa Christina and Selva di Gardena areas on skis in under two days, take a nighttime torchlight walk across crunchy pristine snowfields and enjoy some fabulous cuisine for which they are famous in these parts. (I’ve read somewhere that the highest concentration of Michelin starred cooks in the whole of Italy are based here in South Tyrol). Sounds like hard work…doesn’t it? But we do manage to tick off these boxes. Our 5 * base Alpin Garden hotel and wellness Resort a rather grand building facing down the valley outside Ortisei a few minutes from passing ski and local buses, describes itself as a “world of harmony and pure emotions in the middle of the magic of the Dolomites”. It’s a rustic-luxe place, all cosy corners and traditional carved local wood (the area is famous for wood carving) boasting excellent cuisine and an extensive gin bar, with just about every variety of ‘mother’s ruin’ on offer, including several distillations of pink gin. 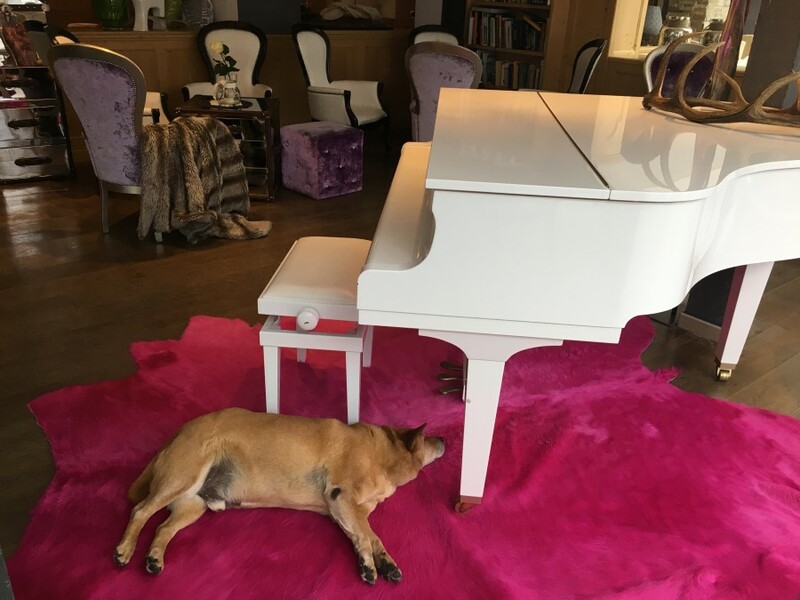 The resident elderly dog, resting on a cerise coloured soft furry rug welcomed us with open paws, pointing big pathetic eyes at a tiered plate of home-baked cookies that awaits guests. This is a dog who is finely tuned in on how to beguile newcomers. 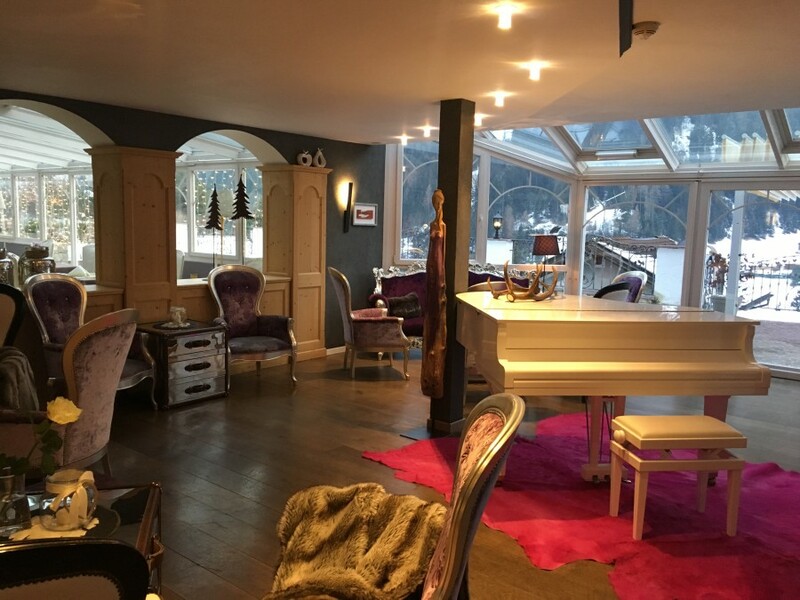 I instantly like this quirky glitzy boutique hotel with its ‘girly’ lilac and silver coloured faux throws draped over bejewelled velvet armchairs where you could imagine the Kardashian clan settling in comfortably at the end of a fashion shoot. Owner/manager Markus appears to have stepped off the catwalk of the men’s collections in Milan in his rotating ensembles that include a maroon and green block checked suit, teamed with red and black patent shoes which any Blues singer would covet.! He advises me to go check out the boutique hotel’s Egyptian themed spa facilities which are among the best in the region after we check into our large cosy rooms with lovely views of the mountains. A glass jar containing more of those home-baked cookies is replenished daily and a handy rucksack which guests can use during their stay awaits us. Taking a well – earned soak, after skiing part of the legendary Sella Ronda, in the outdoor plunge and steaming swimming pools I (momentarily)think of those at work back home before returning indoors for further indulgence where steam rooms and saunas and a tranquil indoor pool with relaxation terraces beckons. Dimly lit treatment rooms offer a dizzying array of anti-ageing, hydrating, peeling and other beauty enhancing bonuses, including milk baths in an oval-shaped wooden tub. These treatments require deep pockets, but this is not a hotel – a small glass of house wine rings the till at €7 – where price is a much of a consideration for its adults-only clientele. 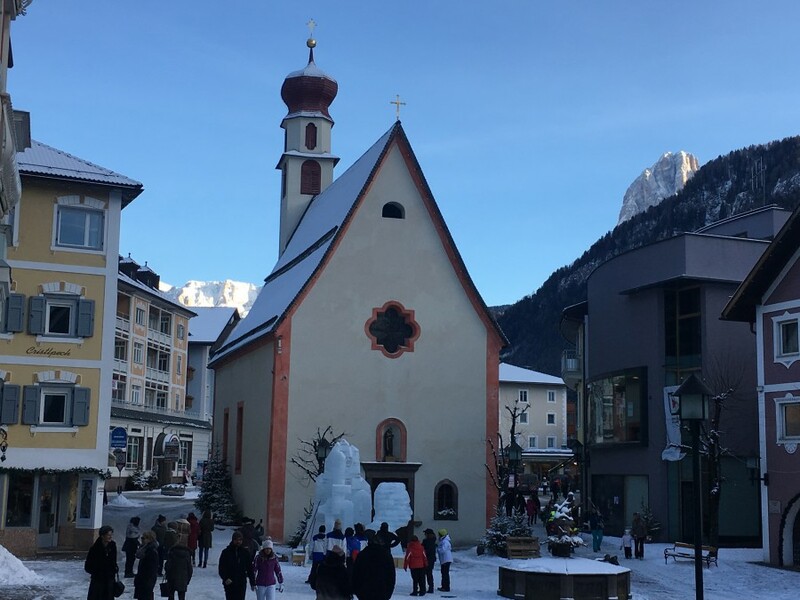 Most of Val Gardena’s winter guests come to discover part or all of the world’s largest linked ski carousel whose 1200 km of slopes spread across 12 resorts, connected by bus and accessible with the Dolomiti Superski pass. 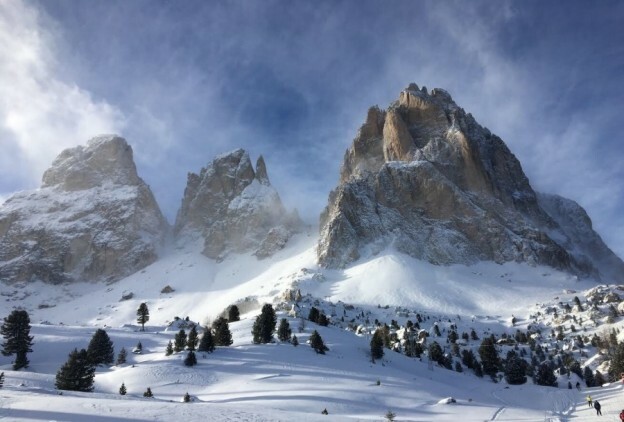 With only limited time, some of us still manage to cover the Sellaronda, a 40 km circular route of which 26 km is skiable, clockwise and next morning anti-clockwise. The popular route gets super busy, especially during holiday periods. While most slopes are blue and easy reds the many lifts can slow progress down, especially in busy periods so start early and allow up to six hours in comfort for slower skiers. My charming knowledgeable guide Isabel shows me red and blue slopes which are almost empty being off the grid from the Sellaronda and worth discovering. 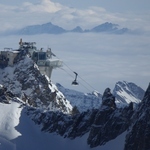 They include Pista Falk flanked by forest and perfect for days when visibility on open slopes is poor, Monte Seura, and other perfectly groomed runs below Col Raieser/Seceda we have to ourselves, each with a sprinkling of huts who offer much better than average alpine fare. Arriving back in the pretty 1200 m high traditional village of Ortisei you can’t but be impressed by its lifts infrastructure and accessibility to the town centre. Instead of lugging skis down icy roads and over treacherous paths tired skiers and walkers are effortlessly taken into the pedestrianized centre by way of tunnels, escalators and moving pavements. A pleasant lunch of tagliatelle ai Funghi, two glasses of wine, water and coffee sets me back €23 in a restaurant on the main square. Of course, It isn’t a patch on Alpin Garden’s fabulous fare, yet hunger is a great sauce. Astonishingly for a town dependent so much on tourism for its revenue Ortisei closes down for a two and a half hour long lunch siesta in winter, annoying when you need to urgently access a pharmacy or any of the shops, apart from the supermarket, a hike away in heavy ski boots. One of the highlights of this short trip to beautiful Val Gardena is a torchlit walk at Monte Pana in the shadow of the mountains under a black sky pinpricked all over with stars. In the distance, across the valleys, we watch the lights of crawling piste bashers working their magic to create perfectly groomed slopes. Our walk led by local artist, historian and guide Diego Deiana takes us past installations, such as a spectacular high sculpture of hands joined together, framing the valley and one of his own works a gold plated symbolic circle across a bridge, signifying the unification of nature and art. After our healthy night trek through the crunchy deep snow (it’s also a snowshoeing route) in and out of forest and on open slopes we adjourn to the local cross-country meeting point “Pana Stua” to enjoy mountain specialities – smoked meats, the famous ‘speck’ and excellent local cheeses, washed down with robust red wine. 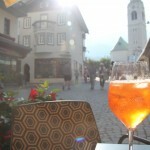 Here it’s time to catch up a bit on the region’s long history and why many of the signs are confusingly named in three languages, Italian, German and Ladin. We are in Italy, but only just about because this region of South Tirol belonged to Austria until World War 2 while the ancient language Ladin, whose origins go back to Roman times, is the daily spoken tongue for at least 35,000, in these parts. 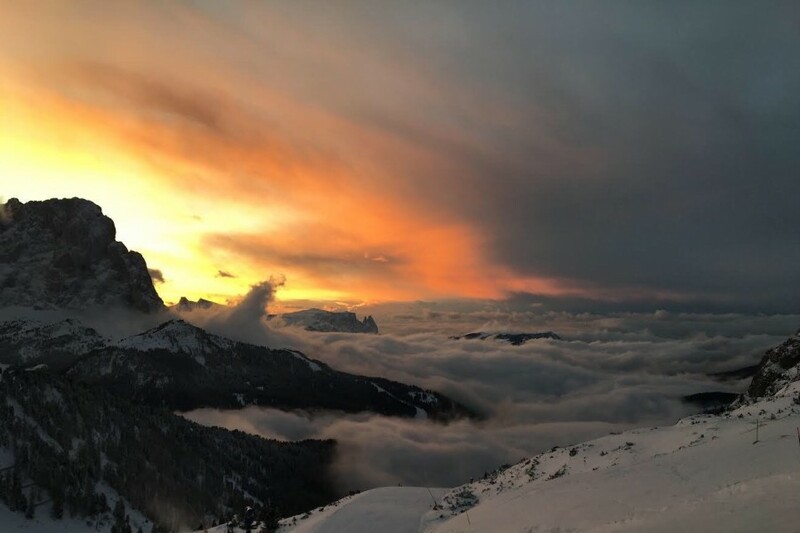 You can’t help thinking this is what makes Val Gardena stand out, apart from boasting one of the world’s greatest mountain landscapes, the sense that you are in Austria and Italy but in neither, yet enjoying the best of both worlds. 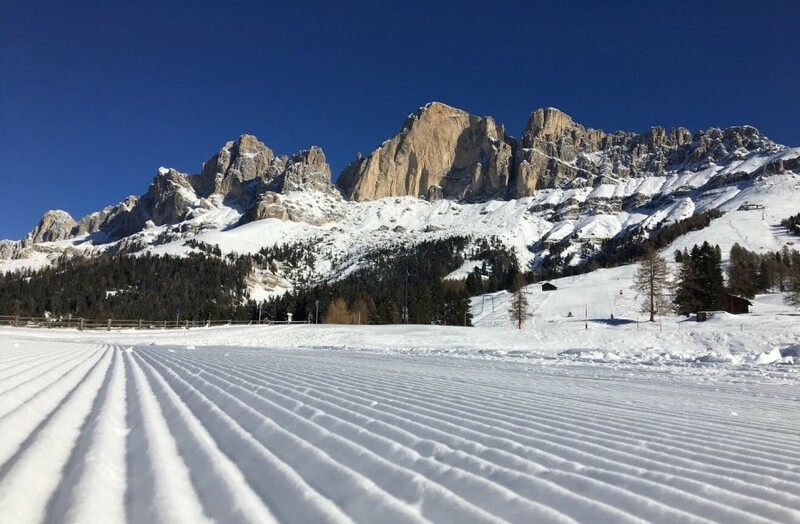 Fly to Innsbruck or Verona from London (Easy Jet; BA) Adult Dolomiti Superskipass 6 days from €243 Val Gardena pass covering 175 km of ski runs and 79 lifts, 6 days from €226. 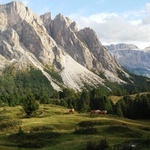 Inghams and Crystal Ski are the main UK tour operators to Val Gardena. 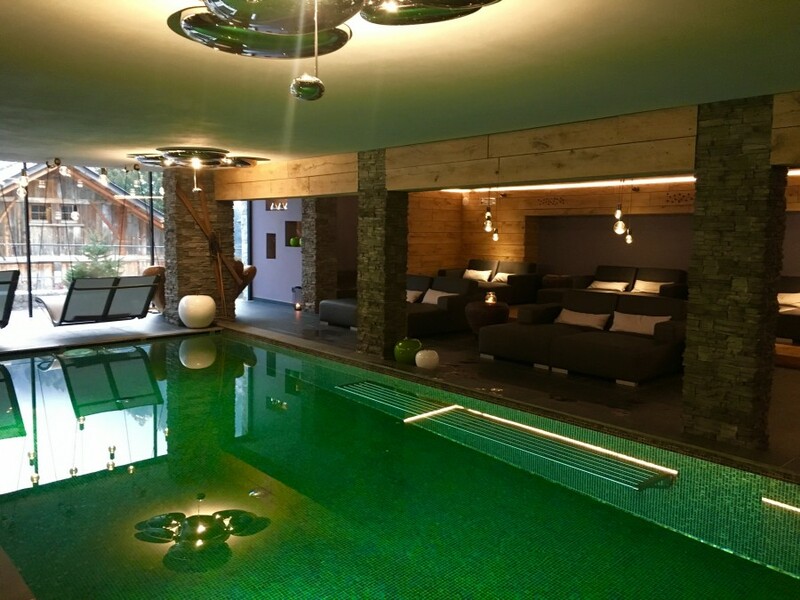 7 nights half board at Alpin Garden from €1332.